Packaging Service| Plainville, MA- Dun-Rite Packaging Inc. Remember, It's Dun-Rite for All Your Military, Industrial and Commercial Packaging Needs, Where We Live Up To Our Motto Each and Every Day. It's Right If It's Dun-Rite. We have worked with the requirements and regulations of MIL-STD 2073 for over 60 years and are totally versed on all military and government packaging and shipping needs and will make the process run smoothly for you. We work with protective barriers, barcodes, and all requirements of the industry. Our services are available for industrial and commercial requirements ensuring that your cargo will be packaged. Dun-Rite Packaging Inc. of Plainville, Massachusetts, provides the experienced and reliable packaging service you are looking for. 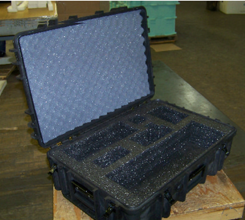 From MIL-STD-2073, wood crating, machinery shrouding, and RFID compliant tags, we fulfill all military, industrial, and commercial requirements ensuring that your cargo will be packaged for a protected, safe delivery. Started in 1956 by Bernard Brown, the former head of shipping and export for Texas Instruments™, we offer more than 60 years of experience in the packaging, marking, and shipping industries. In our early years, our company was moved to Plainville, where it has continued to operate as a family owned business. While our business has worked with the Department of Defense since its inception, we have branched out to meet the needs of industrial and commercial customers over the years. From the smallest component parts to completed equipment, we handle all types of military packaging specifications, industrial, and commercial packaging services. Learn More About Dun-Rite Packaging Inc.